I count myself among those who discourage hiding vegetables, but that doesn’t mean that I don’t play with the way I serve them. Whether or not you’re like me and always tell your kids about the veggies they’re eating (even when they’re “invisible”), this Creamy Cauliflower Mac and Cheese is a sure hit! I count myself among the unfortunate many when it comes to having kids that both don’t like vegetables, and only want to eat their favorite foods (like mac and cheese) every. single. day. of. the. week. I know all too well the need to be creative when serving vegetables. And I’ve tried every which way to give mac and cheese a nutritional boost, whether it be pureed spinach (too green), adding some tomato and basil (not “mac and cheese-y enough”), or adding peas (they were simply picked out). 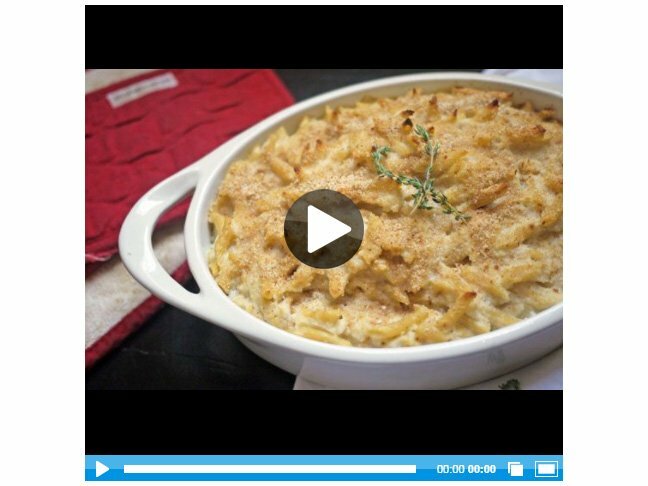 So when my kids said no to my mac and cheese made with cauliflower florets, I decided to try this mac and cheese recipe that incorporated the cauliflower right in the sauce. Instead of tossing florets with pasta and cheese, Bittman purees steamed cauliflower to create a base for cheese sauce. The cauliflower adds great flavor, gives it a mega nutritional boost and, also adds a creaminess that you will not believe. I don’t make a point in not telling my kids that there are veggies in the mac and cheese recipe. It’s not about hiding vegetables, it’s about making them understand that veggies taste really good, especially in their favorite food like pizza and mac and cheese. This one tastes so good that it piques their curiosity in cauliflower. If you plan on keeping the creamy veggie a secret, be sure to serve this creamy cauliflower mac and cheese with side veggies or a salad—you know, to make a healthy point. When my kids said no to a version with visible cauliflower florets, I tried this recipe instead and it was an instant hit. Step 1: Heat the oven to 400°F. Grease a 9-inch baking dish with a little butter. Step 2: Bring a large pot of water with salt in it to a boil. Put the stock with the bay leaves in a small saucepan over medium-low heat. Step 3: When small bubbles appear along the sides, about 5 minutes later, turn off the heat and let stand. Step 4: Cook the cauliflower in the boiling water until very tender, 20 to 25 minutes. Scoop the cauliflower out of the water with a slotted spoon and transfer it to a blender or food processor. Step 5: Add the pasta to the boiling water and cook until still somewhat chalky inside and not yet edible, about 5 minutes. Step 6: Remove the bay leaves from the stock. Carefully process the cauliflower with 2 cups of the stock, the 2 tablespoons oil, the cheese, sour cream, mustard, nutmeg, salt and pepper. (You may have to work in batches.) If the sauce seems too thick, add the remaining 1⁄2 cup stock. Taste the mac and cheese and adjust the seasoning. Step 8: Sprinkle the top with bread crumbs and, if you have it, lightly spray the top of the breadcrumbs with oil (this will help the breadcrumbs brown). 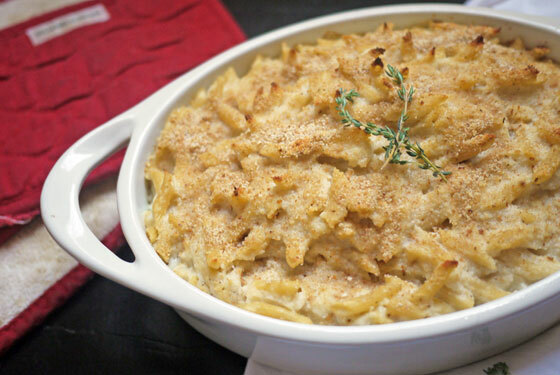 Step 9: Bake until the mac and cheese is bubbling and the crumbs turn brown, 15 to 20 minutes.